Is it so tough at the top? One of Third Man’s abiding cricketing memories is of David Shepherd, not standing on one leg in umpire’s panama and coat, but with both legs rather unsteadily searching for balance on a five star hotel’s plush carpets, his face as red as the Devonian soil from which he grew, holding a champagne bottle in each oversized hand, pronouncing to anyone one who was willing (and to the many more who were unwilling) to listen that, “It’s tough at the top”. ‘Shep’ at that moment had been ‘at the top’ for precisely four hours. The scene was Gloucester’s Nat West Final celebrations in 1973, a few hundred yards from the scene of their triumph on a flat Lord’s deck that had drawn the sting from the Sussex attack. Cinderella had indeed gone to the ball. On a nearby sofa sat three cricketing legends. Between Garfield, St Aubren, Sobers and Frederick, Seewards, Trueman slouched the twenty year old James Clive Foat . The three were swapping stories from their extraordinary cricketing careers, as mates do at such moments. “What is that all about TM? In our days only amateurs bothered to read and there are no amateurs today,” volunteered the Squire. 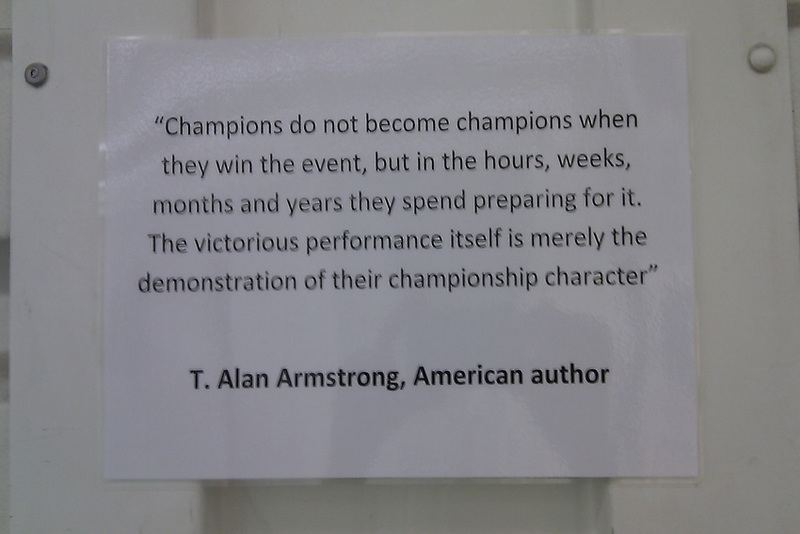 The Squire was referring to the fact that the victorious performance is merely the prelude to events in which the status as champions is put to the test. In a world where we are forced to conform to society, it is necessary to have personal chaos – T Alan Armstrong. Under cover of a thick morning mist and to the eventual consternation of the security team, Third Man used the secret tunnel entrance into Old Trafford today to welcome the visiting Bangladesh team. There they were huddling against the cold damp air that was so sweet for cotton manufacturing and little else. A crane stands by to whisk them back to the dressing room balcony. Eventually it was decided to run off any morning stiffness in case the sun should shine later in the day. It could be camera shake, but it is in fact mist that is obscuring the view. Did the sun shine later? Did Third Man find another way into the ground dressed perhaps as a crane driver? The sun broke through towards midday. 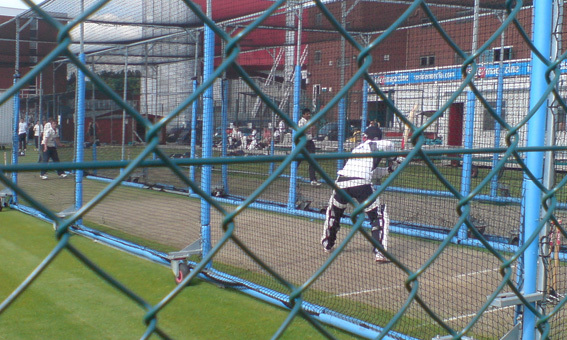 Bangladesh spent a half hour playing their shot a ball cricket in the nets, making way for England to have a couple of hours of diligent practice there in the afternoon. Prior danced down the track to this 16 year old Lancastrian off-spinner who later knocked back Morgan’s middle pole. England openers Cook and Strauss batted side by side towards the end of the net session. The high visibility jacket and hard hat worked wonders for Third Man. Tomorrow is another day. 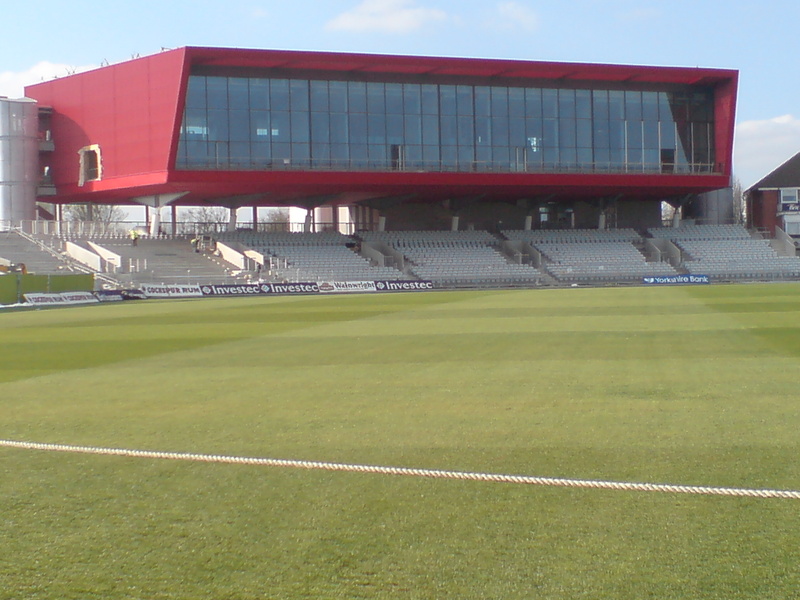 At Old Trafford yesterday evening, The Big Red One was glowing in the reflected light of the setting sun. Third Man took the photograph below to show progress on its construction. The Big Red One - 14th April 2010. 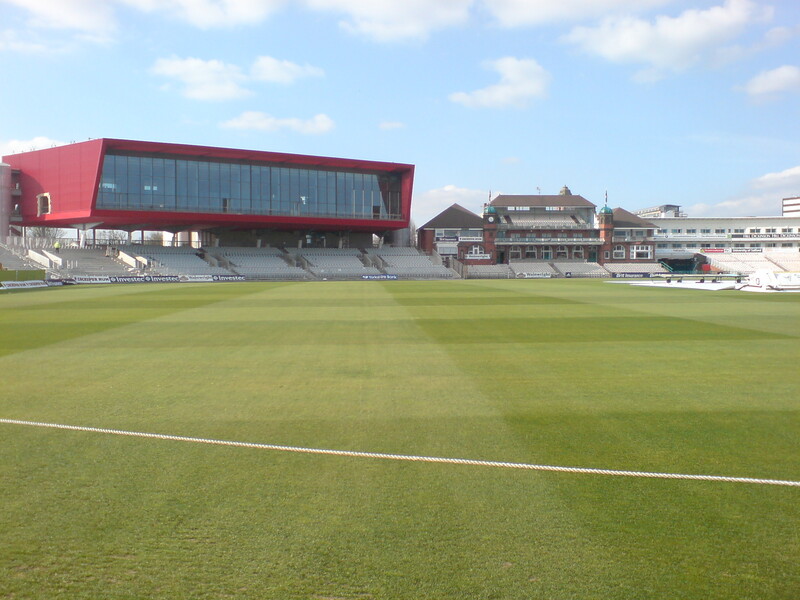 Always on the look for innovations, the authorities at Old Trafford were the first to use a rope to mark the boundary. 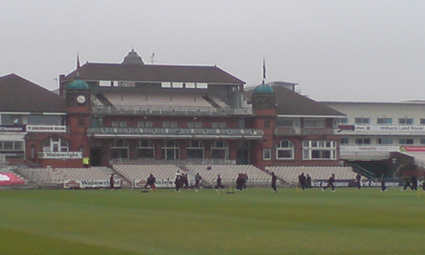 It does tend to dwarf the 1894 Pavilion which in its time provided some of the very best facilities for players, with no less than three baths in the Amateurs’ dressing room. 1894 meets Twenty10 - during the First World War the Pavilion was used as a military hospital. In the Second World War a sentry stationed by the main gate was killed by bombing - the only major cricket ground where a soldier has has been killed on active duty. 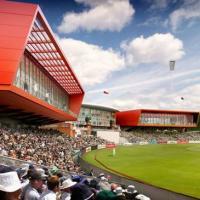 There are plans to raise the height of the Pavilion and to build another Big Red One on the other side. 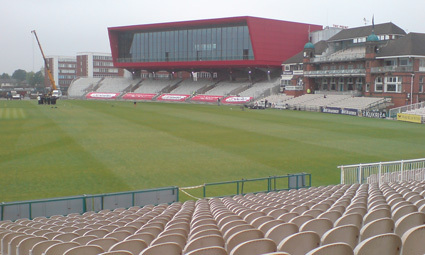 Third Man has learnt from I.A.R Peebles (The Watney Book of Test Match Grounds) that the décor of Old Trafford has traditionally been colourful. On Capture, Corporal Deiderski of Rommel’s Africa Corp, found himself by a circuitous route in a prisoner of war camp in Cheshire. When the war was over he stayed there and, after marrying a local ‘lass’, moved to Manchester to practice his trade as a painter and decorator. 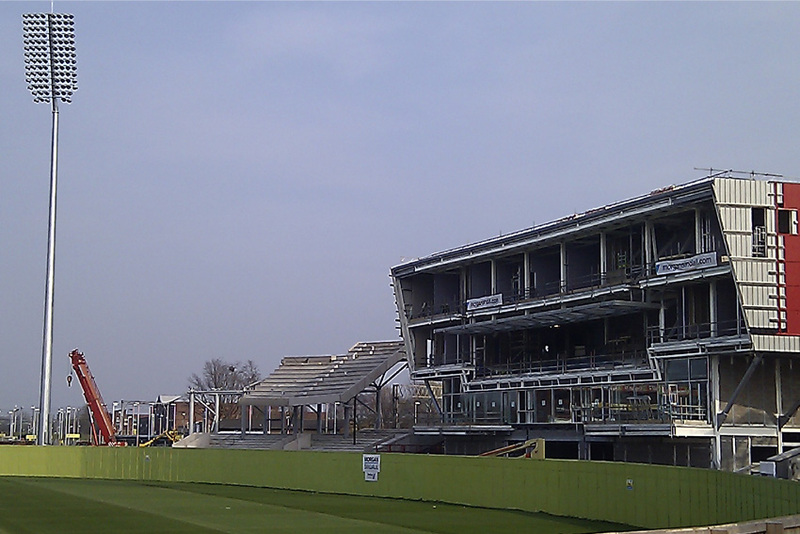 Is it too much to hope that the authorities might consider naming this most cheerful and stimulating addition to their famous ground, The Corporal Deiderski Stand?